Home Services Life Celebration Packages Videotape to DVD Digital Transfers Movie Film to DVD Photographs and Slides Lost Picture Recovery FAQ General Videotape Digital Transfers Photos and Slides Memory Care Lost Memories Pricing Contact Us Why Us? + How do I care for my CDs and DVDs? Look after your CDs and DVDs! 5. Backup (i.e. copy) your non-copyrighted CDs and DVDs at least once every three to five years. A copy on hard disk is always a good option. When CDs, and later DVDs, were first released, much of the hype suggested that they would last for years and were close to indestructible. Unfortunately, much of that information proved false. While you can sometimes repair damaged disks, fading due to light or warping is often irreversible. Not only that, but damaged disks can even further damage your player and may violate your warranty. So it is worth looking after them. Here at Videoscape, we will endeavor to keep a disk-based copy of the DVDs we supply to you - just in case you have problems in the future. We cannot promise to keep them for ever of course, but as an extra service to our customers, copies are kept as long as possible. Of course, some customers, for privacy reasons, prefer that we do not keep such copies - naturally, we are happy to oblige. + How do I care for my videotapes? There are a few simple rules for videotape care - allowing for the fact that whatever you do, the actual tape will still be prone to oxidization. 1. Store tapes vertically like books. Do not stack them. 2. Store them in dry conditions away from moisture. 3. Store tapes away from magnetic fields. Even a vacuum cleaner can help to erase your memories. + How do I care for my photographs? Much depends on the amount of expense and effort you are prepared to expend. However, the first step is to preserve the content of the photographs, rather than the photographs themselves. This is done by transferring them to DVD. Videoscape Productions prides itself in its quality of transfer as well as its restoration capabilities. We would be very please to aid in transfering and restoring your photographs on to DVD. Once that has been done, you may decide to preserve the original photographs too. An indepth guide to this is beyond the scope of this FAQ - you’d be better off getting trained for it! - but the following, based on the National Archives of Australia website, is a good guide for the average person. Never, ever write on or stick labels on the photograph. If the photographs have tape or labels already applied to them, don’t try to remove them. You may cause more harm than good. If your photographs are going to be viewed frequently, then they may be better stored in plastic bags otherwise paper envelopes are usually a better choice since they do not cause or encourage them to sweat. If you do use plastic then sleeves produced specifically for photographic stores are the best option, often polypropylene. Never use PVC. Never use the so called ’magnetic’ albums - where the plastic pages ’stick’ and the photos adhere to the backing board. This is often a death sentence to photographs. Photographs should be stored at low temperatures (the closer to freezing the better) with mid-range humidity. Given the dangers of moisture, you might be inclined to use silica bags, however if the environment is too dry then this will in turn dry out the paper and could cause cracking and other undesirable changes. The National Archives of Australia recommend about 35% humidity. For most people, an internal cupboard is as cool as will be feasible. Always store photographs away from the light. Light will fade the dyes in the photographs and may cause other changes in the chemistry of the image and paper. Don’t leave them unchecked for years on end. A three or six month check of the storage may save your collection! Never store photographs outside, in the loft, under the house or anywhere where the above temperature and humidity requirements cannot be met. As mentioned above, have your collection transferred onto DVD and give copies to others for safekeeping against fire, flood, burglary and other disasters. Check out our Life Celeberation packs and see what all the fuss is about! 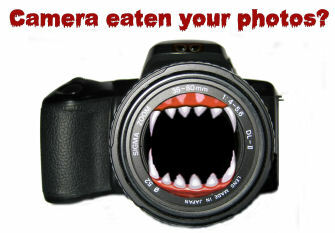 Did your camera eat your pictures? Or did you delete an image or movie by mistake? Or only discover what 'format' meant when it was too late? All is not lost ... we can help.